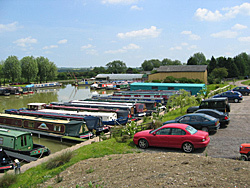 KINGFISHER MARINA is a small (76 berth) privately owned marina situated in a quiet secluded location on the Grand Union Canal in South Northamptonshire at bridge 60. We are just south of the historic canal-village of Stoke Bruerne with its canal museum, pubs, restaurants and the Blisworth Tunnel, and a short distance north of the historic coaching town of Stony Stratford. Milton Keynes with its shops and other attractions lies about 10 miles to the south. The Marina is easily accessible from all parts of the country, being close to the A5 and M1, with London, Birmingham, Leicester and Nottingham all being around an hours drive away. 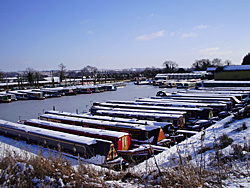 We have non-residential pontoon moorings for Narrowboats up to 72 foot, and some linear (on-line) moorings, we can accommodate some wide-beam craft and there is a covered wet-dock within the marina, which is available for hire. All moorings have access to (metered) electricity, and (free) water. There is adequate car parking adjacent to the Marina, and we have excellent security. Many popular cruising routes are easily accessible from Yardley Gobion, including; River Nene (Middle Level Navigations), The Leicester Line of the Grand Union Canal and the River Soar, Oxford canals (North & South) and the River Thames.